You gotta hand it to Clarence Samuels, the man had quite a pair. Pair of “what” you shouldn’t need to ask if you read the review for the flip-side of his debut, as he parlayed his brief two month stint working alongside Roy Brown at New Orleans’ Down Beat Club in the summer of 1947 into a recording career of his own after Brown hit big with Good Rocking Tonight that September, launching a little something we call rock ‘n’ roll in the process. Brown’s meteoric rise saw record labels soon start poking around New Orleans looking for other potential stars cut from the same cloth. 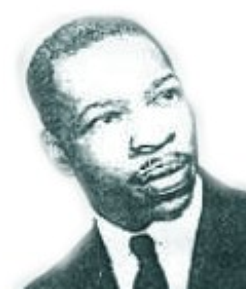 In their attempts to find someone who might elicit a similar reaction Aristocrat Records of Chicago not only signed up Brown’s former “partner” Clarence Samuels but also made sure that they took as many of Roy Brown’s songs for Samuels to record in the process. In other words they were taking no chances. That they didn’t take Brown’s most acclaimed song and biggest commercial noisemaker could be deemed either a fairly astute move so as to avoid legal proceedings or the unflattering comparison between the two singers, or it could be seen as a boneheaded decision considering Good Rocking Tonight was the song actually drawing all the acclaim. Instead they focused on Brown’s other original compositions starting with the salacious Lollypop Mama which Samuels – helped by a more sympathetic band arrangement – managed to match and even slightly surpass Brown’s version. The song they ripped off for the other side of their record – this record – was Roy Brown Boogie, which obviously posed a rather unique set of problems starting with the title of the song. It’d be somewhat counterproductive, not to mention self-incriminating, to use another singer’s name in the title of the song you were now claiming as your own, right down to the writer’s credit on the label. So with just a wave of the hand (and a roll of the eyes) the song magically became Boogie Woogie Blues and with that Samuels own career – as a singer and as a thief – was off and running. Brazen as his decision was to completely steal Roy Brown’s entire act, Samuels probably didn’t have too much say in the matter. I don’t know if he ever claimed to be a songwriter, at least not at this stage of his career, nor did he go seeking out Aristocrat, bringing with him a sheaf of songs he was passing off as his own. Meanwhile the company itself, in the business less than a year with no positive returns to show for their venture thus far, were grasping at straws, hoping that something they came out with might stir some interest. If that interest was gotten on the back of another artist on a rival label which might bring about a lawsuit should your versions take away some sales from theirs, well they’d cross that bridge when they came to it. Besides, the saying goes “Don’t ask permission, beg forgiveness” and with that dubious reassurance ringing in everybody’s ears Aristocrat Records dragged Clarence Samuels into the studio, stuck him in front of Dave Young’s Band and attempted to fit the singer into the suit of clothes worn by somebody else, hoping nobody would notice the shoes were mismatched and the pants were too loose. The amazing thing is Clarence Samuels – for the most part anyway – wound up looking somewhat presentable in the borrowed threads. Now there are clearly more than a few notable differences between the two singers starting with the fact that Roy Brown had one of the more dynamic and supple tenor voices in rock history while Clarence Samuels had a quite limited and nasal baritone. In other words, same songs or not you weren’t going to be mistaking Samuels for Brown any day of the week. The other important factor which separated them was it had been Roy Brown who conceived the entire style of rock ‘n’ roll to take advantage of his own unique attributes, using his exposure to gospel in his formative years combined with a nightclub brand of blues shouting he’d performed and utilizing the backing of jazz schooled musicians which forged something entirely new. All of that, though soon to become ubiquitous as rock established itself, was something that hadn’t been done before by anyone and so for Samuels to try and authentically replicate it was going to be difficult, especially if while doing so you were hoping to still sound like yourself rather than somebody else. Lastly, the compositions themselves were written by Brown, meaning he, not Samuels, best grasped the underlying meanings of the lyrics, the nuances with which to project those meanings, and the mindset to inhabit with which to sound convincing when you delivered them. I suppose because of all this you might feel almost sorry for Clarence Samuels in a way. His one chance to make a name for himself and possibly build a career outside the confines of his hometown came to him under rather dubious conditions, namely all but impersonating another singer. Yet in doing so he was using songs with far more intrinsic appeal than anything he’d likely to have come up with on his own which probably cancels out the pity you’d have for him otherwise. Though he would never become a star he would be a working musician for the rest of his days, cutting some good records along the way and still singing to enthusiastic audiences a half century removed from these inauspicious beginnings. But at the time these came out he had to know, even if he were loathe to admit it, that he was but a mere charlatan. About the only thing that might’ve made this situation more damning for him would’ve been if Aristocrat had re-named this “Clarence Samuels Boogie”, but even sparing him that ignominious fate he’s got his work cut out for him to make this his own, or something reasonably resembling his own. Brown’s original – though a generic boogie in theory – was one of his better early efforts, his vocal enthusiasm meshing well with the rousing playing behind him with his own musicians now amongst the studio crew to provide the crucial support. Remember, Samuels had benefitted on his cover of Lollypop Mama from having a more sympathetic group of musicians than Brown was working with, as Dave Ogden’s group was hopelessly overmatched in Roy’s first session. Though Dave Young’s band were not necessarily better equipped to do rock ‘n’ roll than Ogden’s had been, they at least seemed somewhat more aware of the rough textures they needed to supply in order to highlight that song’s particular qualities. Unfortunately whatever inspiration they collectively acquired for providing Samuels with the appropriate rhythmic bed he required for Lollypop Mama has deserted them after they broke for lunch and came back to cut Boogie Woogie Blues. In fact this sounds like an entirely different group playing in an entirely different era, one which is long out of date to connect with the budding rock fan in the waning days of 1947. Thanks to these changes it would appear that Samuels, who clearly can’t rise to the level of Brown’s gospel-bred shouting on even his best day, has no chance of matching his doppelganger. But while possessing a much more limited voice Samuels wasn’t without his own strengths, most crucially his power. He had a full-bodied tone even if it emanated from his nose more than is recommended, and he used it to reasonably good effect. Whereas Brown’s voice soared, at times risking flying into orbit emotionally, Samuels let his voice resonate, cutting words short rather than leaving them open-ended, giving him a more controlled and emphatic delivery. Though he starts off sounding a little too straitlaced here, almost as if he were being coaxed into singing this against his better judgment (which for all we know might’ve been the case), he loosens up considerably before long and lets himself get carried away with the mood. His lusty interjections in the second half highlight his performance, his cries about “wanting his boogie, which clearly means his woman and her sexual favors, finds him nearly stripping down in the studio, unconcerned with the audience who will be watching him as he deflowers these ladies left and right. If you’re not averse to witnessing such carnal activity then Boogie Woogie Blues probably holds at least some moderate appeal for your sensibilities based on that spirit alone. Unfortunately for all of his enthusiasm… or horniness, call it what you will… Samuels is only one part of the equation, and not the dominant part at that. As with Brown’s rendition the band takes up much of the spotlight and here is where Dave Young’s group shows how ill-suited they were to join in the rock sweepstakes and why, after these flurry of 1947 sessions were over, they wouldn’t return to this field again. The makeup of the band, as typical for the era, is far too heavy on the higher range of horns, something exacerbated by playing in tandem when trying to replicate the excitement needed for a song of this nature. Whereas Brown had the services of Batman Rankins on tenor sax to blow up a storm on his own, thereby creating the main instrumental thrust the song subsisted on, here the shared horn parts are woefully anachronistic. This is the sound of 1945 big band jazz fused onto a late 1947 rock song, both in terms of tonal qualities and musical outlook. They might play with the appropriate gusto but it’s like watching somebody’s mother, or grandmother, trying to convincingly act like a bloodthirsty menace. The actions are going to be stilted, awkward and more than a little discomforting. Not only are the sounds these horns make inappropriate for the song, they’re far too busy in the arrangement as well. There’s no respite from them at all, they’re being instructed to carry the entire musical framework, both melody and rhythm, and it doesn’t take long for this blaring brass to overwhelm your senses. The string bass is about the only thing that breaks through the racket during much of it, taking on a role that would’ve been more suited for a heavy left hand on piano which at the very least would’ve relieved the horn section from their rhythmic responsibilities. Even when receiving some much needed support thanks to a few slamming interjections from the drummer it can’t escape the morass created by the others, as the first time we hear him make his presence known it unfortunately leads directly into a ghastly trumpet solo which immediately breaks the spell. The tepid sax solo which follows that isn’t about to wash the bitter taste out of your mouth either. The drums do their best a little later on to draw your attention away from the brass-heavy crescendos but they still don’t get nearly enough responsibility and so the overall effect they have is minimal and the song sinks under the weight of the band entrusted to carry it. As a result Boogie Woogie Blues winds up falling short in every regard to the song it tried so tactlessly – even crassly – to upend. At the time all of this backstabbing and double dealing was going down however, none of it was really considered abnormal, let alone unethical. Maybe the theft of songwriting credits bordered on it, but it’s not like Roy Brown was going to be seeing any royalties from his own company for his work in that area to begin with, let alone get paid from the sales of someone else’s record whether they gave him credit for writing it or not, so we do have to adjust our own thinking when assessing these things. 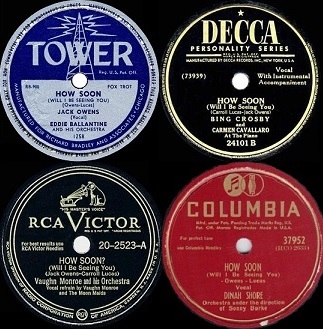 No matter how distasteful it seems today Aristocrat Records was looking at this move as something that was standard operating procedure in American music at the time, from Bing Crosby on down. Every artist cut competing versions of whatever song was deemed promising during this era. In December 1947 when this came out four different versions of How Soon were among the biggest hits in America, three of which were residing in the Top Ten simultaneously and that was hardly a rare occurrence on the Pop Charts. Record companies of the day – major labels and barely solvent independents alike – were all simply hoping for a share of the action and singers weren’t being judged on the originality of their material, only the quality of their renditions. Audiences might prefer one vocalist’s style over another, but they were more interested in the song itself rather than hearing only one interpretation of that song as would happen down the road when imitation was anything BUT a sincere form of flattery. 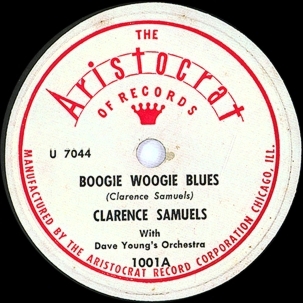 So if Chicago’s struggling Aristocrat label could manage to get some sales around the Midwest for themselves with Boogie Woogie Blues while letting DeLuxe have the Gulf Coast region where Brown was big, and even conceding both coasts (DeLuxe being located in New Jersey, while Brown had a burgeoning following in California), that would’ve been acceptable to all parties. What nobody knew then, or could’ve ever predicted, was how rock ‘n’ roll would do away with that practice of splitting sales amongst multiple artists or regions, thereby altering the music landscape forever more in the bargain. Rock – intentionally or just through its audience’s reactions – would celebrate a perceived artistic authenticity in their performers. Maybe it was simply because unlike other forms of pop music most rock songs didn’t come from outside sources. Professional songwriters weren’t churning out hits in tiny cubicles for them, nor were rock acts prone to taking tunes from popular films or constantly reviving standards, not because they were averse to such things out of a sense of morality but simply because those songs weren’t suited for their style and no credible writers found in Hollywood or Tin Pan Alley were about to stoop so low as to write material for such contemptible outlets as rock ‘n’ roll. So, left to their own devices and largely reliant on their ability to come up with appropriate material themselves, rock artists like Roy Brown wrote their own songs. When someone like Clarence Samuels came along and took those songs for his own use – even though he was a rock artist himself and thus they were just as appropriate for his repertoire as well as Brown’s – a decision had to be made. Whose version was MORE legitimate, musically and ethically, was now being debated by listeners and their answer to that question would go a long way into determining whose career was going to be the one they followed. Clarence Samuels could change the title of the song but he could do nothing change the impression that he was riding on somebody else’s coattails and thus he wasn’t going to be the one audiences embraced. To the modern listener, it’s probably a little weird how prevalent covers were within the Olde Tyme Music Industry. Before the existence of this wonderful blog I hadn’t any idea that “Saturday Night Fish Fry” wasn’t a Louis Jordan original, for example. Rock’s never had an extensive stable of professional writers. Although, rock’s always had some tunesmiths and/or poets for hire. In fact, more modern forms openly discourage outside songwriting to a certain degree (i.e. rap; you can have someone write you a chorus, but you better at least contribute your verses or you’re a poser). Leave a reply on "Clarence Samuels: “Boogie Woogie Blues”"